Given the heat wave of the past few days, I realize that I should have been floating down a river. I’m envisioning cool water splashing people on a boat as the sun beats down from above. I recall feelings of calm while traveling across flat water, followed by the invigoration of roiling rapids. To get you started, Seattle Magazine offers a few suggestions, and there are numerous rafting companies advertising online to help you tackle more challenging waters. This year happens to be the 50th anniversary of the Wild and Scenic Rivers Act, and I’ve been watching some videos that I would like to share. The law was designed to preserve the free-flowing nature of rivers that contain outstanding natural, cultural and recreational values. U.S. Rep. Norm Dicks and U.S. Sen. Patty Murray have announced their support for a plan that would add 130,000 acres of land to wilderness areas in Olympic National Forest, designate 23 rivers as “wild and scenic” and open the door to adding 20,000 acres to Olympic National Park. 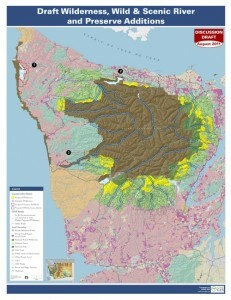 This map shows areas proposed for public wilderness, park and river designations. / Click on image for full map (PDF 10.6 mb). As I describe in a story in today’s Kitsap Sun, the proposal is based on a plan put forth by a coalition of 10 conservation groups called Wild Olympics. The above is one testimonial on the Wild Olympics website, which also includes statements by Bremerton’s Mike Hank of Veterans Conservation Corps, Mayor Michelle Sandoval of Port Townsend, Sequim author Tim McNulty of Olympic Park Associates, Hoodsport’s Ron Gold of RG Forestry Consultants, Aberdeen’s Roy Nott of Paneltech and Gardiner’s Dave Bailey of Greywolf Fly Fishing Club and Trout Unlimited. Wild Olympics was started by Olympic Park Associates, Olympic Forest Coalition, Olympic Peninsula Audubon Society and North Olympic Group – Sierra Club. Added later were Washington Wilderness Coalition, The Mountaineers, Pew Environment Group, Sierra Club, American Rivers and American Whitewater. To counteract the work of the Wild Olympics Campaign, Dan Boeholt of Aberdeen founded Working Wild Olympics, because he does not believe wilderness designations will be helpful. Port Townsend: Dec. 1, 5 to 7 p.m., Chapel Building, Fort Worden State Park Conference Center. Shelton: Dec. 2, 5 to 7 p.m., Shelton Civic Center, 525 W. Cota Street. Port Angeles: Dec. 3, 3 to 5 p.m., Museum at the Carnegie, 207 S. Lincoln St.
Hoquiam: Dec. 4, 3 to 5 p.m., Central Elementary School Library, 310 Simpson Ave.